Forget working at your desk, even one of those fancy hydraulic desks that lifts up and down. No, you need one that is fully immersive, looks like it belongs on the set of Alien, but is also eminently affordable. Hey, to quote Meatloaf, two out of three ain’t bad! Thanks to MWE Labs, you can have the ultimate PC workspace they call The Emperor. 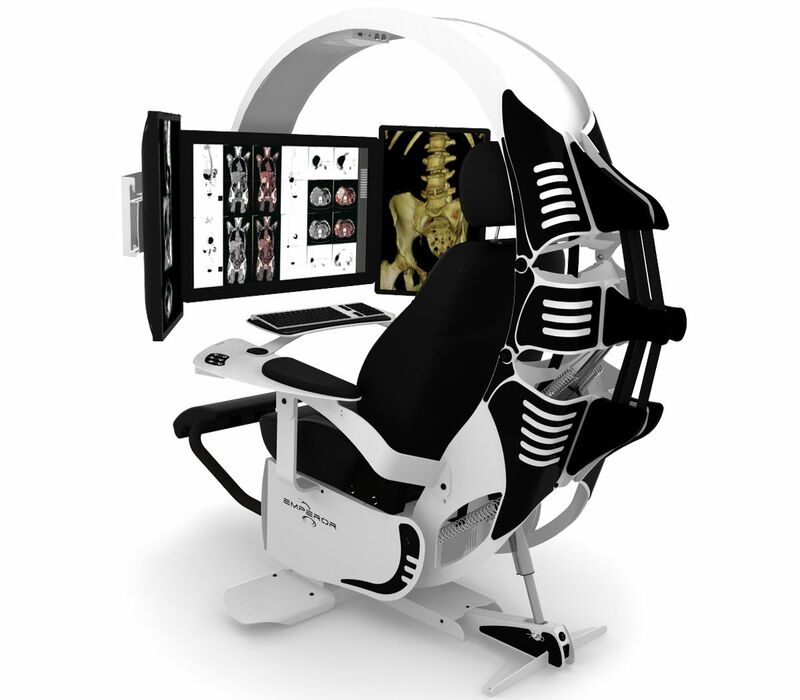 A self-contained pod-like setup that surrounds you with your monitors and controls. Not only that, you can customize it with an array of nice touches, such as color and accent, accent lighting, even custom engraving, your logo on the seat and even a logo backlit front plate! Standard PC customization practices also make an appearance, with RGB and accent lighting available. I especially like how the one on their main page and used in the header of this post is being used for medical purposes and is designed to look like a skeleton. That’s clever. Of course I had to max one out and see how much it would run, and I was not disappointed. I customized the color (black and orange, of course, although they have many colors for both the main and accents), and added in all lights and accouterments. 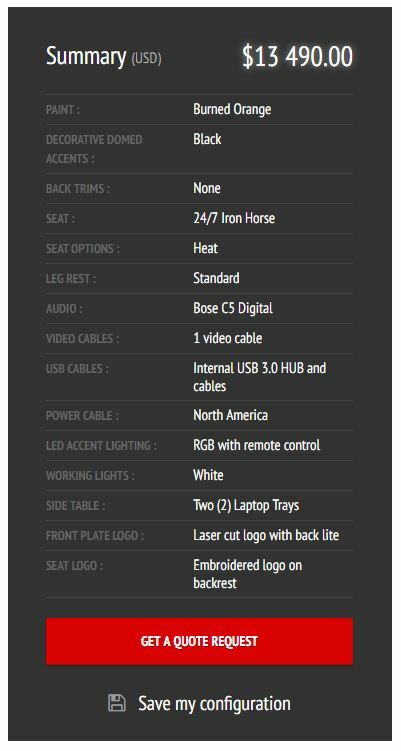 The upgraded seat, which they will stitch your signature into in place of the Emperor logo added $2500 onto the price, the leg rest and heating added $500, and an integrated USB 3.0 hub is $315. After piling on all the other options, including lighting, logos, and two laptop trays, I finally had my dream chair, and only for a pittance. In fact, I’ll take two! That’s a good-lookin’ setup if I do say so myself. It has all the bells and whistles, custom paint, everything someone who avoids physical activity could ever want. Of course, they practically give them away! I don’t know how they can offer them for this low price. If you have a lot of disposable income, what I like to call ‘Notch money,’ then why not? It is probably quite comfortable and a neat experience. 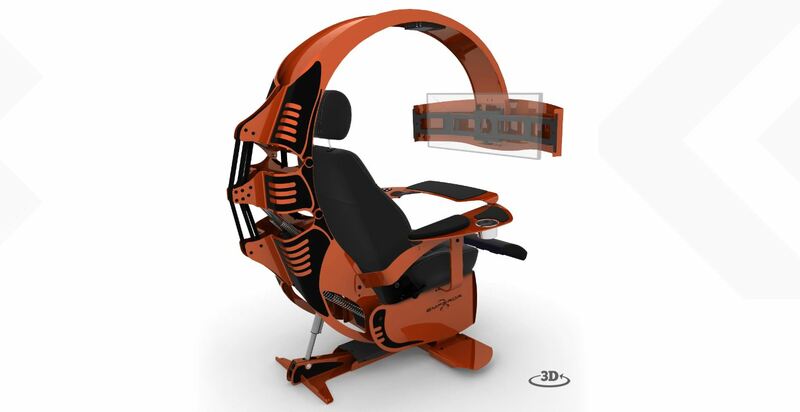 You’ll have to supply your own PC and monitor(s), of course, but if you’re buying a chair like this, I’m sure that won’t be a problem. May I recommend Falcon Northwest? If you get one, let me know; we’ll be instant friends.